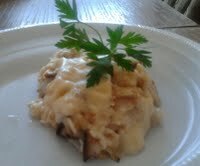 I know the recipe title is cliché but this dish is akin to Mac & Cheese except this time I used maztah instead of pasta. Rather than cooking matza as you would normally cook noodles. You need to allow the matza to soak for a bit but you don’t want to over soak it. Just as using overcooked pasta to serve as Mac & Cheese will result a very mushy dish, so will soaking the matzah for a long period of time. It should still be slightly crunchy before cooking it. I tried making this dish using gluten-free pasta and Kosher for Passover pasta. Unfortunately, my heritage forbids me from using corn made pasta which is a bit of a bummer for me. I much prefer matzah. I actually prefer the real pasta but I suppose I can manage without it for the next 4 days. If you don’t like matzah, you can use other kinds of thin savory crackers for this dish. I wanted to add more vegetables to this casserole but all I had was onions. You can add sautéed mushrooms, peppers, broccoli, spinach, or zucchini. For a meat version, you can use lean ground beef and some tomato sauce. Pasta dishes are very versatile and most recipes are very flexible in terms of ingredients you prefer to use. This dish makes a tasty and filling dairy Passover dinner during the week. It’s also a great way to utilize your surplus of matza that you may have. A bit of herbs adds a nice touch to this dish. Preheat oven to 350 degrees F. Break matzah into peices and let them soak in water for 5 minutes. Saute onions and garlic in a skillet until onions are transluscent. Turn off flame and set aside. Whisk egg whites and milk in a bowl. Add the maztah and a handful of shredded cheese. Add onions and mix. Season with salt, pepper, and herbs. Transfer to a lightly greased 13- x 9-inch (3 L) baking pan. Sprinkle the remaining shredded cheese ontop. Bake covered for 30 minutes and uncovered for the remaining 15 minutes until cheese is bubbly. This entry was posted in Bread, Dairy, Vegetarian and tagged cheese, Dairy, matzah, maztah & cheese, Passover dinner. Whenever I think of paprika, I think of Hungarian dishes. I know it’s pretty stereotypical of me but I can’t help it. Goulash heavily spiced with paprika comes to my mind when I think of Hungarian cuisine. It just comes to show you how little I know about Hungarian food. Although I do happen to like goulash, I’m sure there is more to Hungarian food than goulash. Paprika is commonly used in many Hungarian dishes. This spice is a red made from grinding dried sweet red peppers; used as a garnish and seasoning. The color varies from bright orange-red to deep red, depending on the peppers used. Most commercial paprika comes from Spain, South America, California and Hungary. Hungarian paprika is thought to be the finest, and will be labeled as from the Szeged region. In Hungary there are six classes or types of paprika ranging from delicate to hot. To maintain the stronger taste that consumers expect, some spice companies add cayenne to heat up Hungarian paprika. Paprika is often used in meat/poultry dishes and certain vegetable side dishes. Heat olive oil in a Dutch oven or large skillet with a lid. Add onion and saute over low heat until translucent. Add chicken pieces and brown lightly on both sides. Add red peppers, crushed tomatoes, garlic and paprika. Season to taste with salt and pepper and stir in water. Bring to a boil. Reduce heat to low, cover and cook 35 minutes or until chicken is tender (about 20 minutes if using only chicken breasts). Remove chicken to a heated platter and keep warm. In a small bowl, mix sour cream with flour. Temper mixture with some of the pan juices. Return tempered sour cream mixture to pan and simmer until juices are thickened. Return chicken to pan to rewarm. Sprinkle some crushed pistachios ontop and serve. 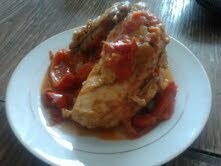 This entry was posted in Gluten Free, Meat and tagged braised Hungarian chicken paprikash, crushed tomatoes, paprika, red bell peppers, whole chicken. Salads are normally served at every meal. Passover is no exception. After all, we need something to balance out the Matzah and salad does it every time for me. Since we are already in to the Spring season, it is logical to use produce that is available around that time. I wanted to try a different salad without romaine lettuce. 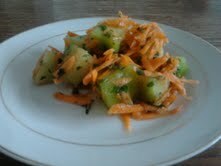 Now that melon is currently available, I decided to use it to make a simple yet fresh salad. I used some shredded carrots and a hint of ginger which fused very well. Just a bit of lemon juice and chopped fresh mint can go a long way. This also makes a great picnic or barbecue salad. This salad can be served at any outdoor event. Toss all ingredients in a salad bowl, mix well, and serve. This entry was posted in Gluten Free, Salad, Vegetarian and tagged fresh mint, green melon, lemon juice, melon carrot mint salad, shredded carrots. Those of us celebrating Passover often ask why Passover night is different from all the other nights. Aside for commemorating the Exodus of Egypt, and turning our houses inside out, we also make several changes in our menu. We are obligated to forgo certain foods for several days, specifically anything made from wheat, yeast or legumes (depending what your Passover customs dictate). But Passover is not just about eating potatoes and Matzah. There are variety of dishes you can make that are gluten-free and Passover friendly. I’ve made and published many recipes on chocolate desserts. 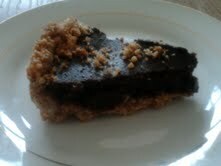 Some of you may be asking why this is different from all the other chocolate pie desserts that I’ve made in the past. Rather than using a regular graham cracker pie crust, I used pulverized gluten-free cookies. Aside for bittersweet chocolate chips, I used Grand Diplomat, a Passover friendly liqueur. If you choose to, you can use chocolate liqueur with a hint of orange or mint. Unlike most pies, this pie requires 8-10 minutes of baking time. Do not exceed more than 10 minutes. A toothpick test would help in this case. This dessert can be eaten all year round and I’m sure celiac family members and friends will appreciate this pie. Eat it as it is or serve it with a dollop of whipped cream and slices of fresh strawberries on top. Or you can sprinkle some chopped nuts. You won’t miss the gluten version. trust me on that one. For a more child-friendly version, replace the liqueur with dissolved coffee, orange juice, or pureed berries (not jam). Preheat oven to 350 degrees F. Mix melted margarine with brown sugar and cookies. Place against an 8 inch pie dish. Bake for 15 minutes. Remove from oven and let it cool. Whisk one egg at a time in melted chocolate. Add the remaining ingredients and mix well. Transfer chocolate mixture into pie crust. Bake for 8-10 minutes or until an inserted toothpick comes out clean. Chill and serve. This entry was posted in Desserts, Gluten Free and tagged bittesweet chocolate chips, chocolate liquer, chocolholic pie, dessert, gluten-free cookies, Grand Diplomat. If you have eaten pecan pie before, this is a gluten-free and vegan version in a brittle form. Unlike pecan pie, however, this brittle recipe does not require corn syrup. 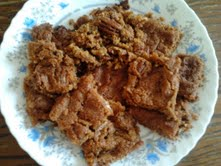 This pecan brittle makes a healthy snack food at social events and parties. They are also Passover friendly and such snacks are highly valued during this time of year. I generally enjoy virtually anything with nuts in them. Or you can eat them at your own comfort. Who doesn’t like brittle? Brittle is practically and oversized cookie that is broken into squares. Nuts, chopped dried fruit, and chocolate chips are ingredients often used in brittles. Hubby normally just sticks with chocolate chips. Sometimes he’ll throw in some oatmeal as well. Brittle can be made in many variations akin to cookies. I decided just to exclusively use pecans as I had plenty of used pecans sitting in my pantry. Preheat oven to 300 degrees F. In a large bowl, whisk together flour, margarine, sugar, vanilla, salt and cinnamon. Toss in pecans. Bake for 30 minutes or until nuts are browned. Allow the brittle to cool before breaking them apart. This entry was posted in Desserts, Gluten Free, Vegetarian and tagged brown sugar, Gluten-Free, gluten-free flour, pecan brittle, pecans, snack food. 5 minutes; remove from pan. Serve warm or cool. This entry was posted in Breakfast, Gluten Free, Vegetarian and tagged avocado, chocolate avocado muffins, chocolate chips, cocoa powder, Gluten-Free, gluten-free flour. Stuffed cabbage invokes a lot of my childhood memories. My mother and my grandmother would serve stuffed cabbage on every holiday. The smell of stuffed cabbage as it was cooking was irresistible. I’ve met people who don’t usually care for cabbage. The two biggest complaints that they have with cabbage is 1) raw cabbage has a bitter taste 2) cooked cabbage alone reeks through high heaven. 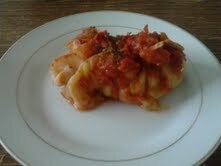 Luckily stuffed cabbage rolls made some of them reconsider their aversion to cabbage. Truthfully, I never liked cabbage as a vegetable but I won’t turn down cabbage salad or stuffed cabbage. Stuffed cabbage is normally served as a side dish or appetizer. People mostly use a head of green cabbage which I did for this recipe. For the filling they will use ground beef, rice, and chopped onion. For a healthier version, I used ground turkey and some chopped mushrooms to give the cabbage rolls a beefy flavor. I seriously considered using quinoa in lieu of rice but didn’t have any which would make it more Passover friendly (if you are of Ashkenzai Jewish descent). This dish can be served at any time of the year with hot tomato sauce (I used crushed tomatoes to minimize the sodium content). You can serve this with sweet and sour sauce as well. Cut the stem from the head of the cabbage deep enough to start a separation of the very outer leaves from the core. Using tongs dip the head in boiling water. This will loosen three or four loosened leaves. Dip again and continue to remove the leaves. You will need to cut the stem as you go, until you have 18 leaves. Boil each cabbage leaf for 2 minutes until softened. Place on towel. Saute mushrooms and onions in an oiled skillet. In a bowl, combine ground turkey, grated garlic, breadcrumbs, rice/quinoa, parsley, thyme, salt, and pepper in a bowl. Add the mushrooms and onions and mix well. Put 1/4 cup meat mixture in each cabbage leaf and roll. To roll put the meat mixture at the steam end of the leaf, fold the stem up a little then each side and roll. Pour 1/4 cup of crushed tomatoes in a large pot. Place a couple of cabbage rolls over the sauce. Repeat layer. Cook covered on medium low heat for 40 minutes to an hour, stirring and basting with the liquid. This entry was posted in Gluten Free, Meat, Side Dishes and tagged ground meat, stuffed cabbage, white cabbage, Worcestershire sauce.